Another Las Vegas? This is the reaction that distinguished author and accomplished photographer Betsy Rogers gets when she explains what her most recent book is about. 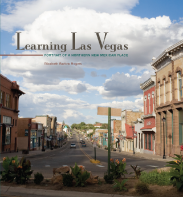 Unlike its famous Nevada namesake, this Las Vegas is a small town that was once one of the most thriving cities of the American West. Sited on the cusp of the southernmost range of the Rocky Mountains and the Great Plains, it was named by its Hispanic founders after the big meadows – las vegas grandes – that define its unique location at the point where travelers on the Santa Fe trail stopped before continuing on the last leg of their journey through the Glorietta Pass. With the coming of the Atchinson, Topeka, and Santa Fe Railroad in 1879, Las Vegas became a major rail hub for freight as well as passenger transportation. Because of the millions of sheep that grazed on the spacious nearby grasslands, it was for a time the wool capital of the nation. The legacy of this era when Jewish merchants established a vital mercantile economy can be seen in the town’s handsome commercial structures and the mansions and charming Victorian houses that line its tree-shaded streets. Both its current Hispanic and Anglo residents prefer to consider their town in opposition to Santa Fe, New Mexico’s famous center of international culture. Deep-rooted traditions and home-grown art and entertainment are this community’s cultural mainstays. In the diverse voices of its inhabitants the reader learns about the meaning of place in their lives. An accomplished photographer as well as a distinguished author, Rogers accompanies her narrative with a portfolio of stunning photographs and numerous illustrations.